Of all the candidates in the slew of local races that voters will decide in Madison's Tuesday, April 2 election, none have anything like Tag Evers' history in the local music community. The longtime local concert promoter, real name Martin Adrian Evers III, is taking his first-ever shot at public office, running for the Madison Common Council seat representing District 13, which arcs over the north edge of Lake Wingra to cover most of Monroe Street and the upper portion of South Park Street. His opponent, David Hoffert, is a Madison native and an Epic Systems employee. Evers giving a candidate interview for the City of Madison’s YouTube channel. Evers, 62, has long been one of the best-known music-business figures in town. He founded his own concert-promotions company, eventually called True Endeavors, in 1992, and over time became a dominant force in booking touring artists. Small club shows were his bread and butter, but he also regularly booked shows at larger venues in town. While True Endeavors had a staff, Evers was generally pretty hands-on, often seen putting up flyers, buying rider items, sending off testy emails to local arts editors, and building up a network of relationships with venues and booking agents. At the moment, it’s kind of fascinating to look back on a time when a sole-proprietorship show promoter had such a central role in the city’s live-music scene. Most people in the music community have an opinion about Evers—though I've had a remarkably hard time finding folks who will talk on the record about him—and it will probably hinge on his power in the music community, his at times irascible and at times expansive personality, his shrewdness as a business operator, and/or his grueling work ethic. "If you visited the High Noon, the Barrymore Theatre or Cafe Montmartre [R.I.P.] to see an indie-rock touring band, chances are you'd see Tag watching the show through black-rimmed glasses at the back of the room," Isthmus noted in an end-of-the-oughts local music roundup in 2009, and indeed he was pretty hard to miss at local shows around that time. Madison-based Frank Productions bought True Endeavors in 2012—up to that point, the two companies sometimes competed and sometimes worked together—and Evers has since worked for the larger company as a talent buyer. Frank Productions merged with Majestic Live in 2017 to form a new company, FPC Live. In 2018 Live Nation, the world's largest concert promoter, acquired a majority stake in FPC Live. Through that process, Evers himself has become a little less visible on the live music scene, but still played an influential role. That said, Evers isn't really running on his background in the music world. He has framed his campaign more around larger issues facing the city, including racial inequity, the need for more affordable housing, and the urgency of addressing climate change on a local level. Then there are issues specific to his district, especially an ongoing dispute over Edgewood High School's plan to build a new football stadium. In between are a few things I wanted to ask him about, namely how he'd approach the city-wide challenge of creating a better, more livable infrastructure for music and the arts in Madison. Evers and I exchanged some emails and had an extended phone conversation; the Q&A below is condensed from both sources. Tone Madison: What do you think of the music initiatives the city has rolled out during Paul Soglin's current tenure, like Make Music Madison and Between The Waves? What do you think these events are getting right, and what are they doing wrong? How could they be improved or changed? Tag Evers: I hesitate to be critical on any efforts to elevate the arts in Madison. Make Music Madison is a fun one day event, and the city is striving to make the event more inclusive and diverse. Between The Waves feels a bit forced to me, but I appreciate the overall goal of creating an event to assist artists in the nuts and bolts of starting a career in music. I remain skeptical of the notion Madison should have a music festival that mirrors SXSW. On the other hand, Appleton’s Mile of Music and Eaux Claires have had a big regional impact, creating economic benefits for both those cities. Austin committed early on to SXSW, realizing the potential economic impacts were huge. The only way to get something like that going in Madison would be for the city to work with local businesses to subsidize the festival for the first several years. Otherwise, it’s financially too much of a risk and won’t be sustained over time. Tone Madison: I'm a bit surprised that you say you're hesitant to criticize any of those efforts, because it's kind of squarely in your professional wheelhouse and you're, I mean, an opinionated person. So I mean, I was just wondering if you had any further thoughts on that. Tag Evers: Well, I'm hesitant because I want to be positive. I know that people are trying, people have been hired and are trying to succeed and they have a charge to try and diversify.... But the notion that a one-day event can somehow or another change the zeitgeist and the dynamic and the flow of an arts scene, to me, is somewhat silly, and sort of speaks to—I think there's a tendency that sometimes a mayor attends a conference and gets an idea and pushes it through and has somewhat of a tunnel vision about it, an almost like "we checked this box" kind of approach. Tone Madison: One thing that's pivotal in the above programs (and other city arts funding programs) is the annual budget process. During that process, the arts (understandably, to an extent) tend to take a backseat to other issues such as policing, infrastructure funding, etc. There might be a bit of public discussion about Overture Center funding, but usually you don't hear alders talking about the nitty-gritty of arts funding during this time. Does the Council need to be spending more time during budget season talking openly about arts programs? How do we create the time and space for more meaningful discussion and debate about these programs? Tag Evers: Richard Florida’s book, The Creative Class, made the argument that public investments in the arts yields tangible benefits. A successful concert at the Kohl Center fills local bars, restaurants and hotel rooms. Businesses looking to recruit and retain top-notch employees can point to a vital arts and music scene. One family donated $205 million to build Overture, the single largest philanthropic gift to the arts in our nation’s history. That same family just donated another $20 million to build a youth arts center on the near east side. Sustained investments by the private sector beyond bricks and mortar, supporting key programs to build the arts in Madison in tandem with city and county funding is key. That said, it’s true there are limits to what we can do with the already strained capital budget. In a city with many unfunded priorities around affordable housing, racial equity, transportation, and protecting our lakes, arts funding is a difficult sell. Tone Madison: That's a very real constraint, but do you think that there are ways to move the needle on that? And if we don't, are we going to be too reliant on philanthropy to steer things into the future when it comes to the arts in Madison? Tag Evers: I think it's a both-and answer. There is room for the city to make additional investments, I believe, in the arts, because it pays off beneficially for the city. The big challenge, particularly if we go into an economic crunch—the last time it was proposed that we make cutbacks in the arts. If you see where I shared that post back in 2008, someone had proposed a $30,000 cutback to the Madison Arts Commission, I believe. So when there are competing challenges, yes, the arts tend to get short shrift. I don't think that it means that we're exclusively reliant upon philanthropy, but let's remember that we're a wealthy city and the arts have long been dependent upon philanthropic gestures. My concern, though, is that philanthropy that takes place in the arts is largely directed towards high-society arts like opera, ballet, the symphony, those kinds of things. And so either our sources of philanthropy become more broad-minded and see that there's a need for investments in jazz and hip-hop and more broadly our musical and visual and digital arts and the kinds of things that contribute to a vibrant city, or we're going to be stuck with this bifurcated high-and-low arts distinction that you certainly don't find in Europe. And I think you see less of that in other cities. This is reflected in our public radio station. WERN [Wisconsin Public Radio's main news and classical station] is committed to classical music as the art form, or the musical art form, that our public radio station here in town supports, with just a little bit of programming for jazz and world music and folk, but nothing like what public and NPR stations do across the country. That's I think, emblematic of our backward approach to the arts in our city. But addressing your question of how can the city budget be loosened up to be able to be more proactive with the arts, I think that's a campaign that I'll participate in and try to bring other allies to the table. Tone Madison: What other initiatives would you propose to use city resources to support music and the arts in Madison? Tag Evers: I would meet with [city of Madison arts administrator] Karin Wolf and [Dane Arts director] Mark Fraire to see what’s at the top of their list of priorities. Similarly, I would convene a meeting of movers and shakers in our city’s music and arts scene to generate ideas for pragmatic improvements. There is a need for a performance space on Madison’s south side. There’s long been a need for affordable studio space for musicians and visual artists, and there’s talk now of using some of the old Oscar Mayer site for this purpose. Tone Madison: When we held a forum with mayoral candidates about the arts, a couple of the candidates actually mentioned Karin Wolfe and said that she deserves more resources and staff. What's your thinking on that? How do we get there given the budget constraints that we're talking about? Tag Evers: To add an additional staff person or part-time staff person to Karin's budget is not talking about a whole lot of money, and also working more closely with the university and Madison College, and more collaborative city-county approaches when Karin and Mark are collaboratively organizing and bringing their concerns to the table. I'm a first-time candidate with a big learning curve, so if you ask me specifically as to what my plan is to how to go about this, I can say that I'm talking to different artists in town, people like Ben Sidran, who have a long-standing concern that Madison does not have sufficient investment in the arts, particularly in its downtown scene. So these are the kind of conversations where I want to be able to network, and connect with people who are active in the arts and particularly in the music scene, and what can we do to take things one step higher. Because, historically Madison has had a very vibrant music scene, but we're still struggling, I think, in terms of being able to support making art as a livelihood. That's a big challenge because a lot of our top musicians end up leaving town...because there's not a sufficient infrastructure for them to be able to survive. So those become challenges. Tone Madison: The infrastructure has always been really lacking and it's hard to have a good conversation about that. These are very long-term problems to solve, but where, where in the short term can people start making a difference? What are things the city can do that don't involve a massive investment up-front but could at least start nudging things toward the right path? Tag Evers: If you think of the philanthropic subsidies for the so-called high arts, what subsidizes the so-called low arts—using this hierarchy that's problematic to being with—is basically alcohol sales. We don't have a viable teen center, an all-ages room, that really works for music. I mean, we used to, when we had the New Loft located downtown, that created a scene, and there was a punk-rock scene in the '90s here that was not just in basements and wasn't in bars, but was in an all-ages space, but when the Overture Center got built, that got kicked out, and it didn't survive when it moved to East Wash. So, those kinds of investments I think help stimulate an arts scene. I think It's really important that we think about how artists find themselves, and it's usually when they're still school, when they're starting young, they discover their creative talents, their creative bent, their creative spirit, so this needs to be fostered in the schools. And Of course, eight years of Scott Walker and austerity since Reaganomics have cut back some public schools. The arts have suffered there as well, I think, Scott, if you look at it in those terms, so what can we do to invest in a vibrant culture in our city, looking at the county, looking at the school district, looking at the city budgets, and figuring out ways to collaborate? And then calling upon the private sector. Those who have a stake in the future of our city to not just make investments in bricks and mortar, but to make investments in programs that will contribute to a vibrant arts scene. Tone Madison: How do we start changing that dependence on alcohol sales? Tag Evers: Well, especially in a city and a state for whom alcohol sales is kind of like a badge of honor, or alcohol consumption. And then what happens, really, to be quite honest, and you could say that I'm part of an industry that's actually contributing to the problem. I mean, you begin thinking of programming talent and artists who are going to contribute to a big beer-drinking night, or a big alcohol-sales night. Call up [High Noon Saloon founder] Cathy Dethmers and anybody who runs a club, for whom that's how you pay your bills, and that's what you start thinking about. For me, when I was running True Endeavors...since I wasn't a venue owner and I lived solely on ticket sales, surely I was cognizant that if the venue had a good night with their liquor and beer sales, I would in a sense ingratiate myself with the venue and the establishment. They'd be happy. Sometimes indie indie shows have a reputation of people who for whatever reason have one beer and stop, where country or metal or certain types of other music, people just slam their drinks down. But the kinds of music that I really like and booked a lot of, sometimes that wasn't the case. So you have to kind of be aware that there are bartenders who are dependent upon tips and a busy night to be able to pay their bills. So yeah, it is really problematic, and it requires some kind of forward thinking to realize that if we're dependent upon alcohol sales, and alcohol assumption is already a thorny issue for this city in terms of the potential for police calls and various types of crime that can happen after a show, when people are intoxicated, whether it was drunk driving, or assault, or vandalism, any of those kinds of things. It's really important for the city to ask ourselves, what, what does a healthy arts scene look like? What would a thriving arts scene look like—and this is not something that [just] Madison is stuck with, this is a problem all across the country. We know from our dear friend Joel and that terrible tragedy in Oakland [the December 2016 Ghost Ship fire, which former Madison resident and Tone Madison contributor Joel Shanahan survived —ed] that artists outside the mainstream who are trying to do art in creative ways that's not subsidized by alcohol sales often have no safe or validated place to do it, and end up in potentially tragic or unfortunate situations, since they're operating outside of the law, so to speak. So how can we surface arts instead of forcing them underground? Tone Madison: The city's Task Force on Equity and Music and Entertainment issued a report last year that makes 31 specific policy recommendations for creating a more inclusive and equitable arts scene in Madison. The report also focuses heavily on how the arts intersect with larger issues, including some of the key ones you've foregrounded in your campaign (racial equity, transportation, housing). There's been a lot of interest in the report but there are also alders who've been dismissive or see implementing some of these recommendations as politically dangerous (especially the ones involving policing). Where do you stand on these recommendations? What will you do to make sure the discussion around the report translates into meaningful change on the policy level? Tag Evers: The report does an excellent job of looking at the root causes of inequities in our entertainment scene. It’s a challenging report, because in addition to addressing specifics about entertainment spaces and nightlife, the report addresses the structural racism that pervades our society. Madison is extremely segregated by poverty, and entrenched, intergenerational poverty falls disproportionately on communities of color. There’s also a demographics issues. Madison has a relatively small population of black and brown people. Apart from the racism of the dominant white culture, there is less economic demand for diverse entertainment and culture in Madison than in larger urban cities. But it’s also true that supply creates its own demand. There’s a valid role for the public sector to play to help stimulate a rich and diverse cultural experience in our city. As alder, I will use my experience in the music industry and as an experienced promoter of Hip-Hop events to advocate for changes in policy that reflect the report’s recommendations. Tone Madison: There is also growing concern about the role that arts and music can play in gentrification. If you look at East Wash, the Sylvee is inside one of Gebhardt Development's new buildings. What kind of role do you think companies like Live Nation should have if they're going to be active in local communities where, as you've seen, there's a fair degree of wariness about them? Tag Evers: Look, and I can't really speak to—remember that Frank Productions operates independently of Live Nation from the standpoint that decisions are made here. Live Nation's not directing any of the leadership team and making decisions. Joel Plant, who's been CEO of Frank Productions, it'd be worth having a conversation with him specifically about that. But my understanding is that there's a great desire for the Sylvee, for example, to be a community asset. Increasingly we're finding that there's real interest in renting the facility from organizations like the Beacon, the homeless shelter on East Wash. The notion that somehow or other because the Sylvee is located on East Wash and development along East Wash has created some consternation among people who are feeling that this is a changing dynamic and as density and infill takes place this is going to dislocate people and disrupt neighborhoods, it's hard to pin the blame on the Sylvee for being part of that. I don't accept that criticism. I think it's a broader concern how we do development in our city, realizing that 70,000—if the comprehensive plan that the city put together is accurate, and their estimate says that 70,000 new residents, Scott, are anticipated here by the year 2040, that's just 21 years away, requiring 40,000 new units for places for people to live, in a city right now that's already struggling with affordability, where people who work downtown can't afford to live here and that we're pushing folks, like nurses and first responders and teachers, to the margins of our city or outside of our city altogether, in essence suburbanizing poverty. And when that happens and there's no transit system to get people in, how does that impact our streets and our transportation issues? Think about Austin. You've been to Austin, you looked at the transportation issues down there, it's a mess. So, the notion that—yes, we need infill and density, but how we go about it is very critical because you have these close-knit neighborhoods and people who have lived in their homes for 30, 40, 50 years, they have legitimate issues and concerns based on their life experiences, and worries about parking and traffic and noise and all those things that may or may not be a part of a new development downtown, but it seems to me that people do want things to do, they do want entertainment, they do want arts, they do want restaurants, they do want retail shops, they want walkability. Young people and millennials, The New York Times in an article a month or two ago...millennials said they want to live in cities, by and large, where they don't have to own a car. So folks are choosing. They want to live in a central location where they can walk to get to the grocery store, to walk to a club, to be able to take the bus somewhere, to be able to hop on their bikes or ride somewhere safely in a protected lane where they're not subject to perhaps being run over and those types of things. So to have a vision of a city that includes all those things, it's not grandiose but nor is it free from challenges and problems and obstacles and the potential for mistakes requiring correction and adjustments as we more forward. But we have move forward, Scott. We can't stay as we are. The city is growing rapidly, changing rapidly, and we need to keep up with it. Tone Madison: Being an alder isn't a full-time job in Madison, but how would serving on the council impact your role at FPC Live? What else do you see ahead for yourself, either in civic life or other career pursuits? Tag Evers: When I joined the Franks back in 2012, I became part of a team, no longer responsible for everything like I was when running True Endeavors. I have more bandwidth now as an employee instead of a business owner. The management team at FPC have been very supportive of my run for office. I’ll continue as the Senior Talent Buyer at FPC once elected. As to the future, time will tell. It was a very gratifying experience working with the Tammy Baldwin campaign and Bon Iver’s team in producing Tammy’s very successful fundraiser at the Sylvee last October. I hope to be doing more of the same ramping up to the 2020 elections. Tone Madison: There are areas that city government deals with where obviously you've got experience that's relevant, but where there might be like overlap between the city's interests and the interests of your job—for instance, the future of Breese Stevens Field, which the city owns and where FPC Live hosts concerts. When things like that come up like that, where do you think you're going to have to draw the line? Tag Evers: Well, that's what the city attorney's for. Tone Madison: I realize there's a there's processes in place for these issues and that most people on the council will have something or other that might come up because, again, it's not a full-time position. But I was curious about how you would approach that stuff if elected. Tag Evers: I'm not running to try to advocate for the company I work for. That would be disingenuous and false and inauthentic of me and that's not who I am, Scott. I have no problem backing off. And as I've stated in this interview, I'm not willing and I'm not speaking on behalf of Frank Productions, and if you wish to get a comment from Frank Productions or FPC Live, I suggest you speak with Joel Plant, the CEO. He used to be Mayor Dave's chief of staff and he understands quite clearly the role of municipal government. And the Franks have been very encouraging of me to get involved. They see this as a passion of mine. Also, having sold my business, Scott. I have a little bit more bandwidth. I don't come home from work thinking 24-7 about all the shows that I've booked and how I'm going to make them work. I'm a talent buyer, whereas I used to have to do everything pretty much. I was the first one at the show and the last to leave and the guy who probably ran out and got all the hospitality. That's not me anymore, and I'm no longer designing the marketing campaigns for these shows and no longer the accountant who has to figure out whether the show made money and make sure all the bills get paid and the taxes get paid and the licenses are up to date. So I have more bandwidth. More time to give back. And where there's areas of any kind of conflict of interest, I'll certainly seek advice on those or find out where those lines [are] and back off. I don't have any problem with that and I assume, I know the Franks don't have any problem with that, and like you say, I don't think it's uncommon for a council member to have an issue or a potential conflict of interest that they need to be mindful of. Tone Madison: If you're elected, how do you want people from the arts community to interact with you? 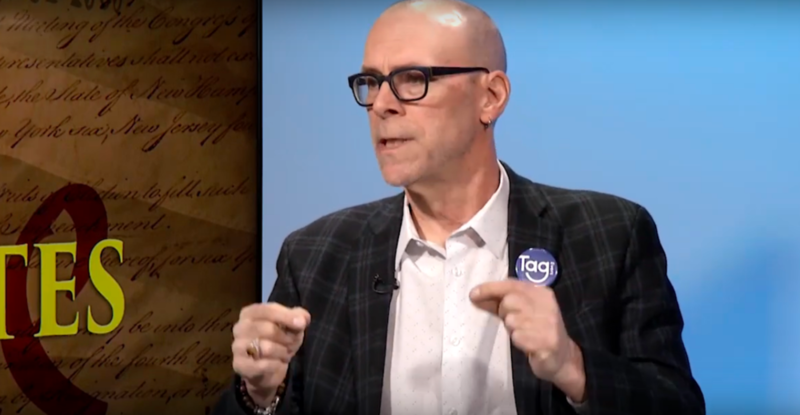 Tag Evers: I do want to be seen as an advocate for the arts, so I would want artists and others to feel comfortable to reach out to me generally. And then specifically, if there's an issue of interest that comes to mind, so that I can network and form coalitions with other council members. Perhaps it's an issue in another district and I can be called upon as someone who can work with the council person in that district and persuade them of the importance of that. But more broadly speaking, when we're talking about coalition-building or kind of a consortium or networking and trying to figure out how to move forward, I want folks to see me as an advocate for the arts and one who's willing to give space to grassroots leadership in our community, to see how we can move forward as a city to create an even more vibrant arts scene. This is the first time I've ever done anything like this. It's a big learning curve. It's a lot of responsibility. The last eight, nine months since I started running, I've been studying the issues. It's a little bit like being back in grad school. It's all one big independent study and nobody gives you a syllabus. You kind of have to figure out the landscape and tackle the challenges and issues one by one.